Chicken wings are always the hit of the party, and they're easy to prepare and keep warm for serving. Use the marinade for cut-up chicken wings or drumettes. These chicken wings are subtly spiced, similar to everyone's favorite Asian take-out wings. The marinade adds the fabulous flavor. All you do is marinate them in the refrigerator for three hours, drain them, and bake. That's all there is to it. If you need an early start, combine the chicken wings and marinade a day in advance or up to two days before you plan to cook. This marinade contains just the right balance of acid and cooking oil along with spices for flavor. Feel free to add additional ingredients. Chopped or mashed garlic or finely chopped onions are excellent additions as well. For heat, add some Asian style chili sauce (Sambal), cayenne pepper, or some crushed red pepper flakes. Sriracha sauce is another possibility. Garnish the wings with some sesame seeds or sliced green onions if you'd like. Serve the wings along with the sauce (see the marinade safety tips below the recipe) or use another Asian-style dipping sauce. A commercial or homemade sweet and sour sauce or plum sauce are also good choices. The recipe is easily scaled up for a large gathering or family. Using a sharp knife or poultry shears, cut a chicken wing through each joint, making three pieces. Discard the tip portion. Repeat with the remaining wings. In a nonreactive container or food storage bag, combine remaining ingredients. Add the wing pieces and seal the bag. Marinate in refrigerator for 3 hours, turning bag occasionally to keep all wings coated. 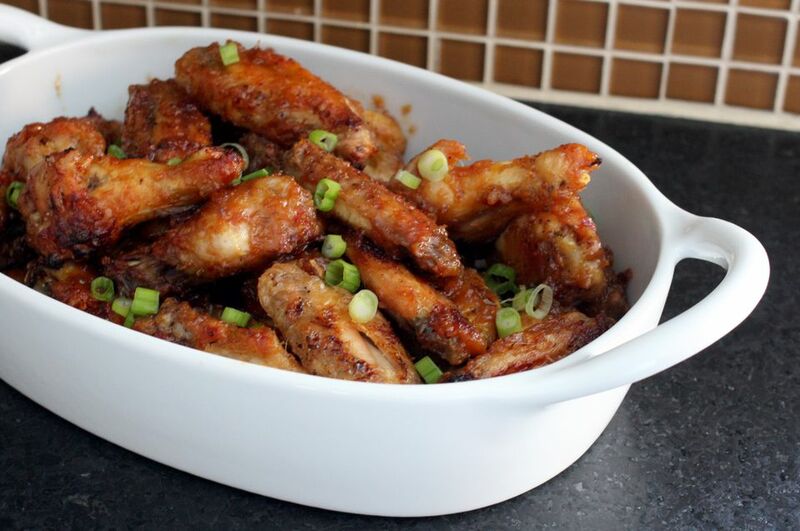 Drain chicken wings and place them on a rimmed baking sheet. Bake in the preheated oven for 30 minutes, turning once during cooking until chicken wings are well browned and done. Put the hot cooked wings in a slow cooker (or chafing dish) and set it to warm for serving. If you are making the wings a day in advance, refrigerate them until the next day. Reheat them in a 350 F oven to 165 F before you put them in the slow cooker. Marinate in nonreactive containers, such as glass, stainless steel, or plastic (food grade). For quick and easy cleanup, use a sealable food storage bag. Always marinate food in the refrigerator and keep the container covered. If you plan to use the marinade mixture as a sauce, the best solution is to double the ingredients and refrigerate half of it to use as a sauce; use the other half to marinate the chicken and then discard it after removing the chicken. Alternatively, you may bring the used marinade to a full boil, which will destroy any harmful bacteria.